The most famous Kenya Animals are known as 'The Big 5' and the animals behind the 'The Big 5' are: Lions, Leopards, Elephants, Buffalos and Rhinos. It sure is a sight to behold to see these animals in their natural habitats and in their elements. You also recognize that it is you who is visiting their home. It will be a good idea to make sure not to overstep your boundaries and respect the animals habitats. It can be a humbling experience, but also an amazing one, to visit with these incredible beasts! It is a wonderful......well, sometimes a little scary thing to hear the roar of a Lion in the heart of the night, in the middle of nowhere, in a tent with no fences anywhere close. It is an encounter, that you will remember as a very special moment. There is something to be said about experiencing all this in the real surroundings and not at home in your living room in front of a TV or while visiting a Zoo. To hear, feel and smell it, is indeed the 'Real Deal'. 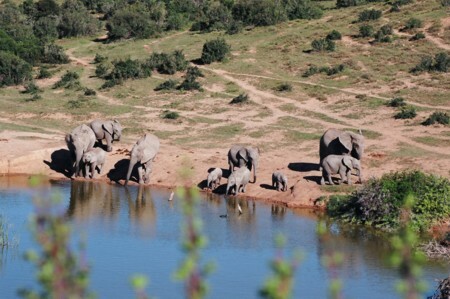 Besides these 'Big 5' there are many other animals and every single one is incredible to watch. From the Giraffes, Zebras, Hippos, Baboons, Wildebeests, Warthog to all the different Antelopes, Gazelles and numerous, distinctive Bird species. I’m compiling some fantastic animal videos on the "Photo Gallery" page. You should go and Check it out!! Find the FULL LIST OF KENYA WILDLIFE here! The habitats of these animals range from the Savannah, to Forest areas all the way to Wetlands. If you move around a bit, you will have an excellent chance of seeing all these Kenya animals. 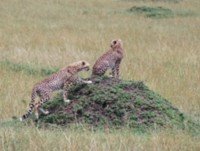 When on safari most tour operators will include visits to these different habitats to give you a complete picture of the wildlife and ecosystems of Kenya. In the animal kingdom, the predators seem to draw the largest amount of attention. The most famous in this category is the lion. 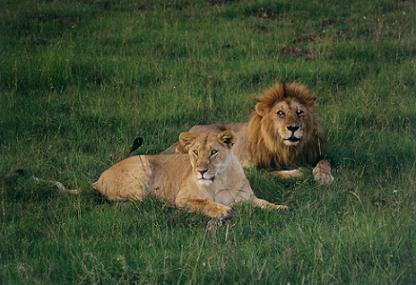 The largest of the great cats in Africa, they spend a great deal of time resting in the shade. When the pride goes off to look for food at dusk or dawn, it is mostly the female who does all the hunting, but sometimes the males drive the prey towards the concealed females who then do the actual killing. Living on the savannahs in prides of one to three males and up to 15 females, lions can look like docile cats stretched out in the sun. Especially the young cubs, who find a lot of enjoyment in bugging their moms, who are taking their well deserved naps after a night of hunting. The graceful leopard lives a solitary life except during the mating season. The beauty of the dark spots against the rich gold background belie the power these cats can muster if necessary, and it is indeed very hard to find them. Generally considered night-time animals, the best place to find them is in rocky hills, high in tree branches or in the thick woodland brushes. As agile as a common cat, they drag their kill to the top of a tree where they can be assured that no scavenger will find it and disturb their dinner. They are the only big cats who do that. The elephant can live up to between 60 to 70 years and will eat vast amounts of green material to survive each day. Elephants are found roaming in close knit herds with the matriarch in charge. Younger and older bulls live alone, away from the herd. These large beasts flap their ears to keep from overheating. When ear flapping is combined with snorting however, it’s usually a sign of agitation and a good time to put some distance between you and them. Elephants communicate with each other with any number of sounds and over long distances. They can quickly adapt from open plains to thick forests and are constantly on the move for food and shelter. Click here for more information on African Elephants based on a more personal note and also some info on Asian Elephants! 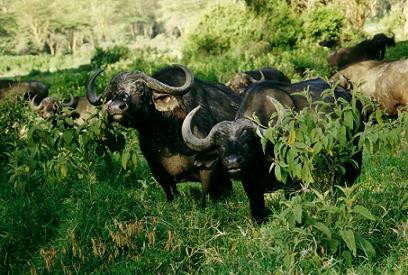 The African buffalo has a reputation of having a bad temper if disturbed. These huge ox-like creatures have some very heavy, dangerous looking horns and have no shame in using them to get rid of any kind of pest, humans included. They can usually be found near water, but also in Savannah areas, like the Masai Mara. Large herds gather on open grasslands and smaller groups tend to congregate in thick forest. They are also known to chase Lions around here and there. And this is an incredible event to witness! Once a thriving creature, the Cheetah is now a highly endangered species. Conservation is the key to this awe inspiring animal and we must work to achieve that goal to keep these special Kenya animals alive. A fully-grown giraffe can measure up to 5.5m high. There are three subspecies of giraffe found in Kenya. Zebra Pictures taken in the Masai Mara National Reserve. There are three species of zebras; two of them live in Kenya. The Burchell's, which is the smaller of the two and the Grevy's, which is mostly restricted to Tsavo East. The Swahili word for animals is mnyama (wanyama, pl.). Here are some translations for your "BIG 5" Kenya animals; you might like to brag a little while on your safari. Safari, by the way, is the one common English word that is derived from Swahili. It means a trip or journey of any kind. Please go to the SWAHILI page!